What Lies Ahead for Bitcoin Gambling After Jon Matonis’ Resignation? 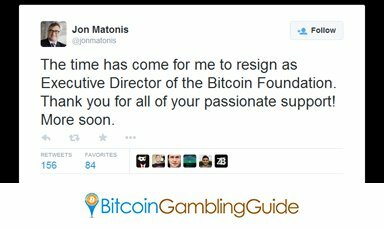 Home » What Lies Ahead for Bitcoin Gambling After Jon Matonis’ Resignation? Jon Matonis has been one the few faces of Bitcoin that pushed for a wider acceptance and consciousness about the digital currency. He gave voice to Bitcoin during the time when society and global markets needed a central figure, and he was among the key individuals who formed the Bitcoin Foundation. He assumed the executive director position in the foundation, but effective Oct. 31, the post will no longer bear his name. During his term, Matonis was instrumental for a number of achievements made for and within the Bitcoin ecosystem. The foundation made available the access to vital information and communication, sped up global consciousness regarding Bitcoin, and spearheaded campaigns for mainstream adoption. With Bitcoin Foundation to run under the new leadership of Patrick Murck, the Bitcoin community will be closely watching what the next steps will be for the foundation and the digital currency. After all, decisions and actions made by the foundation may shape the world of cryptocurrency today and tomorrow. As such, the question of whether or not the Bitcoin gambling market must be troubled over the change of leadership is something to address. At present, Bitcoin regulations that have and are being finalized pose threats to the business aspect of the digital currency. Among the sectors that will be largely affected is the growing Bitcoin gambling market. Some Bitcoin exchanges and Bitcoin casinos have already seized their operations in certain regions or countries due to the legal implications of the regulatory policies. Unfortunately, what is left for Bitcoin gambling bettors and operators to do as of yet are to speculate and hope that the online gaming landscape will remain free of strict guidelines that may hamper the widespread availability of various gambling services to players worldwide. Nonetheless, the community will continue to play its role as one of the promoters for a global Bitcoin adoption.